Hey there, hope you all had a great weekend! We spent most of Sunday helping my parents move their things onto a moving truck, and since they’re downsizing, they graciously donated some bookcases to our Alma Project. I’ve been scouring Craigslist for weeks without any luck, so how fortunate to score some sturdy freebies from my folks! Now we can build that entertainment center we’ve been planning for so long. I also managed to squeeze in an hour to put the finishing coat of paint on a simple project I started last week. My little girl is at that age where improving her reading ability is priority number one, so I wanted to build her something that would keep books front and center in her world. These inexpensive bookshelves are made from basic wood brackets and dowel rods found at a home improvement store, and they cost me about $15 each. 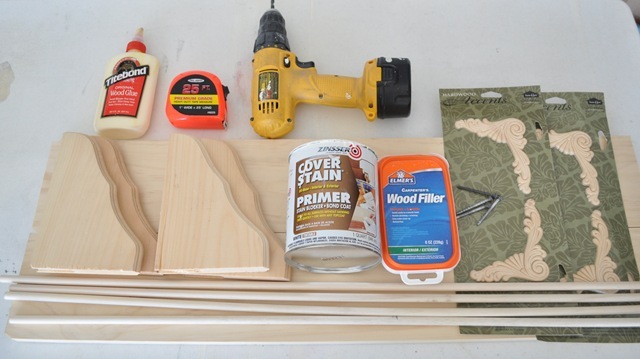 If you want to replicate the project, here’s what you’ll need for each shelf: 2 basic 6” x 8” wood shelf brackets (I found these at Home Depot), ½” thick wood base cut to chosen length; 2 dowel rods; wood filler; wood screws; power screwdriver and drill bits; wood glue; primer and paint. Decorative appliqués are optional. 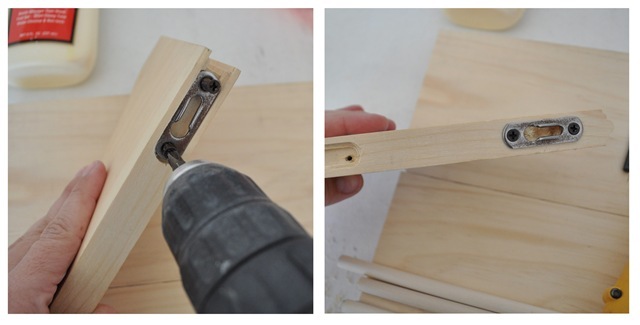 Next, determine the position of your dowel rods, and use a drill bit to create a hole for them. Drill two holes in each bracket with the proper sized drill bit, being careful not to drill all the way through the bracket. 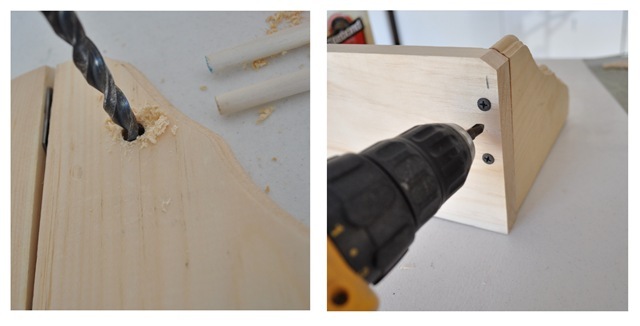 Use wood glue to secure the dowels (cut to the proper width) to the holes drilled into the brackets (not pictured). Once the wood glue is dry and dowel rods are secure, drill small pilot holes, then use wood screws to affix the brackets to the wood base. 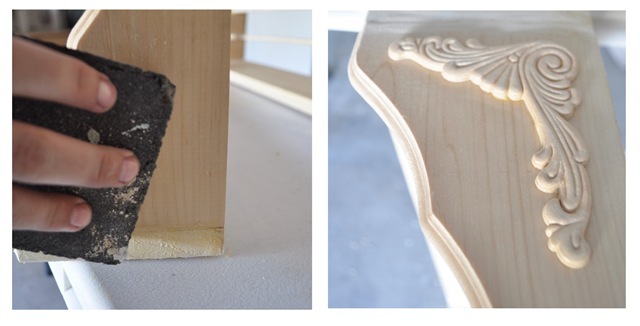 Use wood putty to fill any seams, and sand edges when dry. 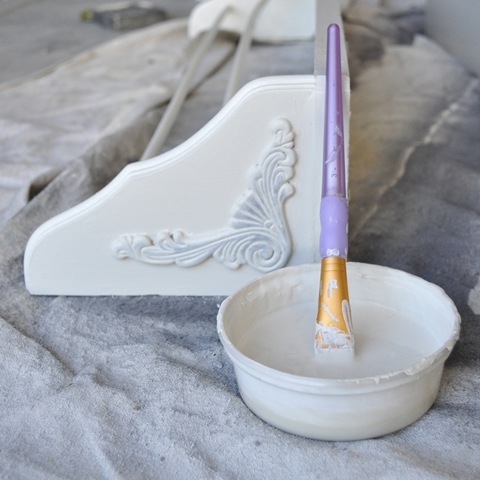 Use wood glue to attach the decorative appliqués (optional). Prime and paint bookshelves after assembly. Cost: Brackets $2.50 each; dowel rods: $0.85 each; wood board $1.50 a foot; appliqués $5.00. Total cost = approximately $15 each (including appliqués, not including screws, wood glue, wood filler, primer & paint). I love the idea of rotating the books on the shelves to entice my girl to pick a few new books everyday. It seems to be working . . . The best part for me is my growing girl now has a reading corner to call her own, and a place I can send her everyday to improve her skills and encourage a lifetime affection for books! I do have plans to say farewell the pastel pinks in this space, but a new color palette will have to wait a few more months. These days, I’m just so happy she’s becoming such an avid reader. I’ve been longing for so long to DYI a bookshelf for my twin daughters’ school books. But my husband is busy at work. I dont have time to do it myself coz im also busy at the store. Maybe this weekend i can convince my husband to do this. Thanks for this DYi. You surely made my day. My youngest (now 12) is also an avid reader. She goes through a new series books every two days. It’s expensive and wonderful. Kindle, here she comes! I love your daughters special space. Its beautiful. I am always so happy seeing young people read, because reading can mean so much and take you on so many adventures. Love this idea and I can’t wait to try it. I, also, love the paint color on her walls. What is it? Thank you! They look wonderful, way to go encouraging such an important thing! Wow, this looks so simple. It’s so great to see kids reading rather than playing video games. Way to go! Cute! I’m going to try those in my daughters room! Great job! I love these shelves. I have been looking for a way to store my cookbooks in the kitchen and this might be just the idea I needed. :-) Thanks for the great post. Probably making some of these today! We have soooo many books, and I love your idea for rotating them to encourage interest. Thanks so much! Love it! Definitely making some of these for my daughter’s room! She’s my little bookworm! Thanks so much for this! I’ve been asking my husband to build our kids bookshelves for their books but he kept telling me he needed a guide or plans and this is perfect!! I will show him this and hopefully he can make them for us! 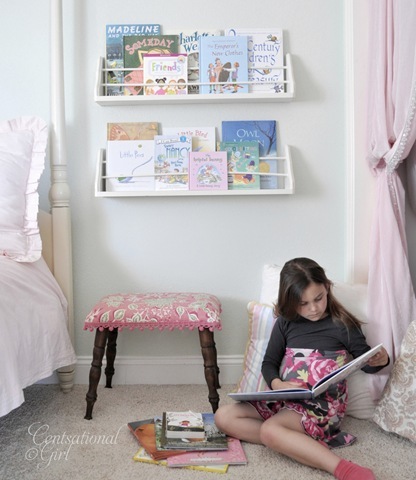 I’ve been debating which type of open bookshelves to do in my kid rooms – these are fantastic! Thanks so much for sharing it with us all. 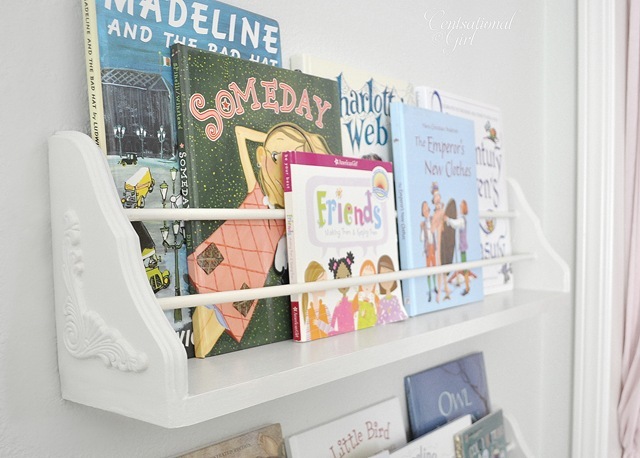 That’s such a great idea….love the dowels to hold two layers of books! And what a cutie your little reader is! Love these. Might have to give it a go in my son’s room. Fantsstic job! I love those. I have never picked up a drill or a saw in my life. I can sew like a champ, but I’ve never made anything from wood. What basic equipment do I need to buy (drills, saw, screws etc)? Did you teach yourself how to do things like this? Have you taken any classes? Did you pick up a book to learn or did you find the info. on the internet? I would love to be able to make things like this, but I don’t have a clue where to start. To me, sewing is simple because you follow directions on a pattern, but this intimates me. Hey Denise, yep I taught myself how to do it all, including using a compound miter saw to cut the wood, but you can also have your wood cut and several home improvement stores like Lowes or True Value. Lesley, the color on her walls is a pale green, it’s Ralph Lauren’s ‘Thistle’ but HD no longer carries RL paints. I’ve heard that they still do carry the formulas though! Beautiful! I’m going to bookmark this for the playroom redo I’m working on. I have a bookshelf in there but I like this idea much better! Thanks for sharing. Genius idea! I love it…and beautiful work! You are seriously SO creative! I totally aspire to be this handy and creative one day! The bookshelves look great!! Just a tip – to make sure you don’t drill too deep (for the dowel rods), wrap some painters or masking tape around the drill bit so you know exactly when to stop plus the bit won’t be able to go any further. The magic when beginning reading changes to reading. A very special time. Very special shelves too. Thanks for the clear directions. Hey Tina, I cut the wood myself at home, but Lowes will cut it for you for free! You make it look so easy! I definitely want to try this for my boy’s rooms. Thanks! Kate, what a super project! I am reading teacher, so I love seeing how you are encouraging your daughter to read. I saw two of my favorite books, Owl Moon and Charlotte’s Web. The reading corner is a great idea! Keep books everywhere for her (and you) to pick up and read. 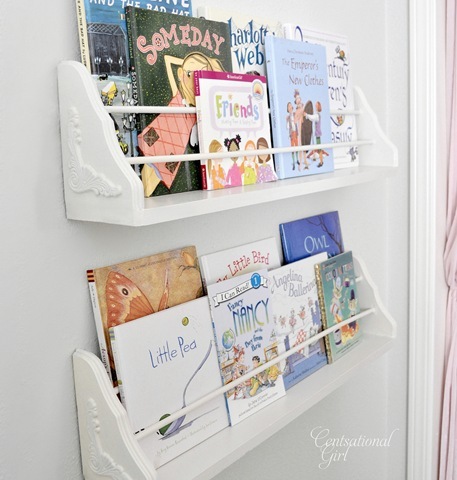 I love these little book racks! What an inviting reading nook. I wish you had a pic of the dowel assembly. Cute project. Love this! And great idea for enticing your daughter to read. ;) Your projects are always so creative! lovely! Such a good idea to have the books face-forward. It’s much more appealing to young kids. Fabulous project Kate!! Super sweet to boot. Love these, Kate!! I need to do this for my girl…thanks so much for sharing the how-to! Amazing!!!! You always come up with awesome ideas, that’s why I keep coming back to your blog! keep up the great work!!!! Love that the books face out so the kids are more likely o grab them! Wow Kate! I have been following your blog but had to come out of “lurkdom” for this one. I love how we’re now able to give our children everything they need without breaking the bank. Her room is soft and pretty and this reading corner is such a great space for peace, love and feeding her curious mind. Bravo Kate! Your daughter is a beauty by the way… stay blessed. I absolutely love this!! I’ve been trying to figure out what to do with a blank wall in my newborn’s nursery and this is perfect! P.S. I’m a new follower! Love the bookcases! Nice tutorial! Can’t wait to see how the new room looks like. Oh i love these!! My three teens have to share a room and this would be so handy since space is so limited for them! I am totally working on a similar project for my little girl’s room! The front facing books definitely make it easier for her to make her reading selections . . . she is only two and LOVES to read. Definitely her favorite past time. Great job and I love the carved wood detailing. That is just genius. I need to make these for my boy’s room! Great tutorial girl! I am so excited to see this project! The shevles look so nice! We do something similar with our books. I am working on shelves in each of the boys rooms so we do seasonal and holiday favorites for our swapping out. I’ve seen a bunch of these around, but this is my favorite yet. Love the simple construction but beautiful look! I just wanted to let you know that I am featuring this on Sassy Sanctuary tomorrow. Thanks! Absolutely adorable. Great Idea and Thank you for sharing in detail. I am building one for my 5 year old son. I love it!! I think I’m going to make these for my room! We used your tute and made these over the weekend! We used the larger size bracket just because we thought.. more bracket = more storage. We were a little stumped, because we assumed the bottom board would be a standard width to fit the bracket, so what we ended up doing is buying a board that was close to the width of the bracket, and then cutting the bracket to fit the board. Somehow my husband convinced me that this was easier than cutting down a large board. It was a fun little project. Thanks! Thanks for the inspiration Kate! I made one of these for my friend’s daughter. I painted her name and some ladybugs, butterflies, and flowers on the front edge to make it personalized for her. It turned out very cute! The previous commenter mentioned the bottom board not being the same as the bracket size. I too had this problem, so I ended up joining two 1 x 3 boards for the base and it was nearly the perfect size. I love it! !I am totally working on a similar project for my little girl’s room!We used your tute and made these over the weekend!The shevles look so nice……………..
I’m curious where I can find decorative appliques like the one you used. I love these! My husband and I are new at DIY but plan on making these! Can you tell me how long your shelves are? Thanks! HI Clare, they are 31″ long. These look so nice!!! I have a small spare room in my house and I’m turning it into a mini library for the kids as they have so many books and I can’t wait to fill the walls with these bookshleves!!!! These are very cute. I found you via Lil Blue Boo. I’ve pinned it. Thanks!